The stage but echoes back the public voice. Up to 1937 barns and schools were the only venues for functions such as drama, dances and concerts, which was the only entertainment at that time. At the time house dances were also a very important part of the Local Community. In every house there was an instrument: a fiddle, an accordion, mouth organ or tin whistle. The Free State government introduced the House Dance Act of 1935 which banned dances , dancers and musicians. You had to get a licence to hold a dance even in your own house. They came up with a moral argument against dancing and ….if you don’t mind . . a sanitary facilities argument. But as one commentator said, at the time, “the Government don’t care if you make your water down the chimney as long as they get their money.” BUT A breach of the law could result in a court appearance and penalty. With a big population of young people around the area and most of them were able to entertain. It was talked about at these house parties that a hall should be built in the Leghowney area. 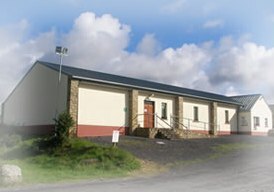 A final decision was taken at a meeting in Edward Traver’s Barn in January 1937 that a hall would be built and a committee was set up, a site acquired in Aughlim in Ned Gillespie’s field and for some unknown reason this site was not built on. 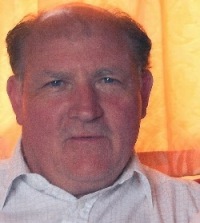 The location was to be changed to a field belonging to Edward Murphy. Building work started in June of 1937 and the famous Leghowney Hall was opened on the 11th of November 1937. The site for the Hall cost 5 pounds and the structure of tin and timber cost 400 pounds. 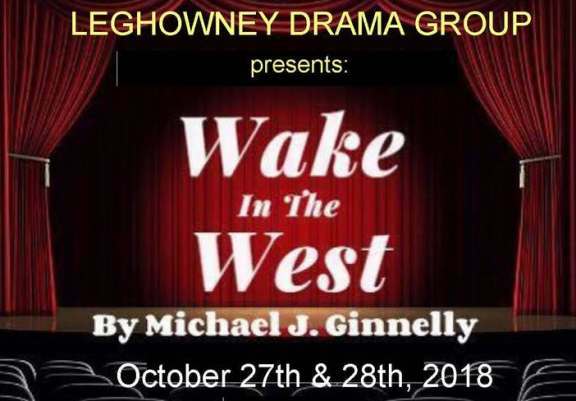 The Leghowney Drama Group first came together in the Autumn of 1937 to begin to learn and rehearse what was to be their first ever production, a three act play ''Pike O' Callaghan'', by English playwright Wybert Reeve. It was staged to a full house in the new hall on 28th December 1937. I don’t know how Michael Joe was wired but even if he was wired by a plumber his “Wake” is literally sweeping the boards nationwide. 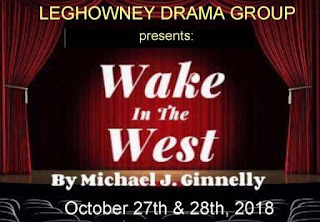 At about the same time as the Leghowney Drama Group was set up, the late Anew McMaster said: "The preservation of the theatre has passed from the hands of the professional to the amateur." One need not look further than Leghowney (or New Jersey!) to see how true this is. 80 years ago Leghowney Hall was little more than a corrugated shed with only gas lighting and oil lamps to read the scripts. Heating was scarce with just a little solid fuel stove to provide some warmth. John O’Neill was born in Drumgallon, Co. Monaghan, on the 9th of March 1834 to John and Mary O'Neill. His father died of scarlet fever, six weeks before young John was born. His mother, unable to eke out a living in Ireland and fearful for her children's survival, emigrated to the United States in the latter part of 1835 with two of her children and settled in Elizabeth, New Jersey. John stayed behind with his grandfather, In December of 1848, at age 14, John left Ireland to join his mother and siblings in the United States where he completed his formal education. His first job was with a Catholic publishing company as a sales representative and a number of years on the road he settled in Richmond Virginia, where in 1855 he opened a bookstore. 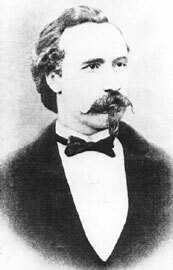 In 1857 he sold the bookstore and enlisted in the Second United States Dragoons but disillusioned with the lack of action, O'Neill went AWOL and headed west to San Francisco where he spent the next few years. While living there O'Neill met his future wife Mary Ann Crowe, an Australian of Irish parents. In 1859, having second thoughts about his desertion from the Dragons he turned himself in and, fortunately for him, was returned to duty without trial. At the onset of the Civil War in 1861, he was stationed in San Francisco with the 1st United States Cavalry, formerly the Second United States Dragoons. He returned to the east coast with his regiment who had volunteered for action in the Union Army. In March through July of 1862 the regiment was engaged in the battles of the Peninsular Campaign launched by the Union army in an attempt to circumvent the Confederate Army in northern Virginia and capture Richmond the Confederate Capital. On June 27, at the battle of Caines Mill, O'Neill was promoted from sergeant to the rank of second lieutenant for gallantry He volunteered for service in the Union Army and served as an officer in numerous regiments during the Civil War. This veteran of the American Civil War had the rank of "general," bestowed on him by admirers because he commanded three Fenian incursions into British-governed Canada, first directed colonists in 1874 to this fertile Elkhorn Valley site which bears his name. General O'Neill also induced other Irish groups to settle at Atkinson in Holt County and in Greeley County. Knowing the agricultural heritage of his people, he said his object in founding Nebraska colonies was "to encourage poor people in getting away from the overcrowded cities of the East." O'Neill's real historical significance arises from his service, beginning in 1866, with the Fenian Organization, whose stated goal was to create and support an Irish state independent from British rule. In 1876, O'Neill summarized his feelings with the following statement: "I have always believed in striking at England wherever we could reach her, and wherever the English flag floats and the English government is recognized and there are English soldiers in arms to defend the flag and maintain the government I hold that the Irish people, particularly the Irish Exiles whom her oppressive laws have driven from their native land, have a right to go there and make war on England." On June 1, 1866, O'Neill led a Fenian invasion of Canada with the goal of using occupied territory as a bargaining point for Irish freedom. The invasions would ultimately fail to achieve their stated goals and O'Neill was arrested by United States Marshalls upon returning to the United States. John O'Neill, the boy from Drumgallon, led the establishment of Irish "colonies" within the United States. The first Irish colony in Nebraska was set up in Holt County in the town that bears his name today - O'Neill City, Nebraska. 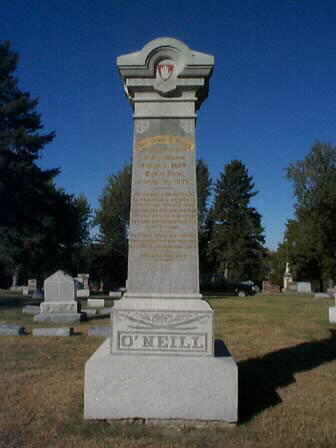 O'Neill died on January 8, 1878, and was buried in Omaha, Nebraska. Eist has now brought out a 4 CD set of John’s talks Celtic Spirituality in which he explains, in layman’s language what he calls “other dimensions of reality.” Several times in the course of those talks he reminds of how we tend to ignore our spiritual side. 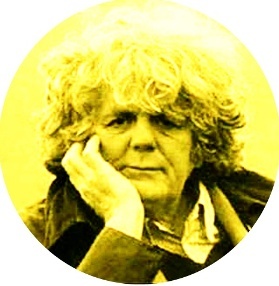 He emphasizes how unfortunate it is that, “ Our eyes become economic brain tumours.” In this series of talks, which were recorded in Glendalough, brings the listener on a spiritual journey in which the north Kerry habit of describing a woman as ,”a fine mare” is linked to the Hindu approach to the female. An inebriated Gaelic speaker, in Conemara, who couldn’t pronounce “W” in English, lost his bearings one dark night and asked John, “Fare the f*ck are we”? What other theologian could use that story to illustrate how we are losing our way spiritually? Even the sentence structure of the Healy-Rayes is worked into the mix. This CD set is a must. Details of Celtic Spirituality can be found at www.eist.ie also a list of recordings of talks, made by Eist, at the World Meeting of Families in the RDS in August.